Viewpoint Tickets - Best prices on Yankees tickets, MLB tickets and MLB All Star tickets. Location: Just north of the existing stadium, between 161st and 164th Streets, and between Jerome and River Avenues. 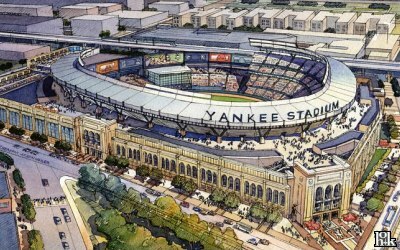 The Yankess began construction on a new stadium across the street from the current Yankee Stadium in the summer of 2006. Completion is scheduled for the 2009 season. The project is part of a larger redevelopment plan that includes a hotel, conference center and high school for sports-related careers. 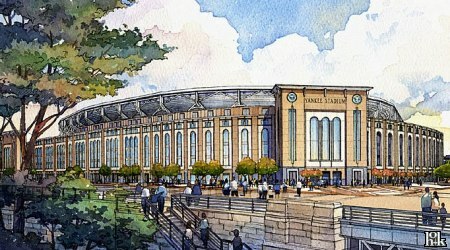 The stadium will feature an exterior facade which will replicate that of the original Yankee Stadium. The interior of the stadium will be a separate structure, rising above the top of the exterior. From the outside the structures will look similar to the original stadium. A "great hall" between the exterior wall and the interior structure will feature five to six times more retail square footage than the current stadium. The signature frieze, the lattice work that once rimmed the original stadium's roof, will adorn the new stadium's roof in the original copper. Just before leaving office in December 2001, former Mayor Rudy Giuliani reached a tentative agreement with both the Yankees and Mets to build them each an $800 million, retractable-roof stadium. Upon becoming mayor, Michael Bloomberg made it clear that he had other priorities and the ballpark plans were put on hold indefinitely. The proposed Yankees ballpark would seat 47,000 people and feature a retractable roof. The interior would include the facade, as well as the original field dimensions, from Yankee Stadium. Soil from the outfield would be moved to the new stadium. The city would finance the stadiums by issuing $1.6 billion in bonds, and the teams would have to reimburse the city. Giuliani emphasized that the stadiums would pay for themselves and made good business sense. 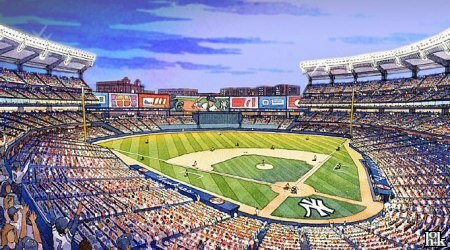 In the summer of 2004, New York newspapers reported that the Yankees were on the verge of announcing plans for a new ballpark next to Yankee Stadium. It was rumored that the Yankees would forgo the retractable roof and increase seating capacity to approximately 56,000. As of January 2005, the Yankees have said nothing on the subject. In January 2005, it was reported that New York City planned on spending $1.1 billion on three sports complexes: $600 million for a Jets stadium on Manhattan's West Side, $300 million toward a new Yankees ballpark and $200 million toward a Nets arena in Brooklyn. The Mets have said they expect to receive the same $300 million subsidy as the Yankees. In April 1996, the city and state of New York and Yankees owner George Steinbrenner completed a study of four possible sites as a future home for the Yankees. One of those is now the site of the proposed Jets stadium. The other sites studied were Van Cortlandt Park, Pelham Bay Park and the site of Yankee Stadium, all of which are in the Bronx. The study also found that renovation of the Yankees' present stadium in the Bronx would cost at least $770 million (1996 dollars). Several years ago, New Jersey gave the New York Yankees a plan for a new baseball-only stadium that would hold about 50,000 people and cost about 50 percent less than a multipurpose sports stadium in Manhattan. The Diamond in the Bronx: Yankee Stadium and the Politics of New York by Neil J. Sullivan. Yankee Stadium: 75 Years of Drama, Glamor, and Glory by Ray Robinson, Christopher Jennison. Yankee Stadium in Your Pocket: The Fan's Guide to Yankee Stadium by Kevin T. Dame, Ryoji Yoshida and Christine Dame Yoshida. Stadia: A Design and Development Guide by Geraint John and Rod Sheard. Field of Schemes: How the Great Stadium Swindle Turns Public Money into Private Profit (2nd Edition) by Joanna Cagan and Neil deMause. Public Dollars, Private Stadiums: The Battle over Building Sports Stadiums by Kevin J. Delaney and Rick Eckstein. Sports, Jobs, and Taxes: The Economic Impact of Sports Teams and Stadiums by Roger G. Noll and Andrew Zimbalist. Modern Marvels - Domed Stadiums (VHS). All images courtesy of the New York Yankees. Tickets to NCAA Basketball Tournament, College Football Bowl, NCAA Football, New York Mets, New York Yankees, Paul McCartney, Wicked New York, NCAA Basketball Tournament, College Football Bowl, NCAA Football and Wicked New York provided by Ticket Triangle.